A credit score is simply a snap shot of your credit profile at any given point in time. This profile is a mathematical algorithm which analyzes key data and generates a weighted score. It changes as new information is added or deleted from your credit file at the (bureau) repositories. A credit score can be slow to manipulate because the time it may take the bureau to update the information. The bureaus store information on your credit history both past and present. The bureaus, or credit repositories of information are; Transunion, Equifax and Experian. Each repository maintains information on you independently, therefore information can be different at each repository leading to different scores. For example, you could have a Nordstrom card with a 30 day late and if Nordstrom only reports to Equifax and Transunion, this will explain why your Experian score is higher. For this reason, Banks drop highest and lowest and your use your middle score when analyzing your credit score. I would like to begin with listing the 5 major factors and their respective weight as they apply to the scoring models used to generate a score. An understanding of these factors and how to strategically manage them can lead to a higher score. 1. Payment History- simply put, do you pay your accounts on time. If you do, you have nothing to worry about. If you have any lates, then your payment history considers the recency, frequency and severity of late pays on your credit report. Recency refers to how recent the late is. The more recent the late, the lower your score. So pay special attention to the last 12 months before you pull your score. Frequency refers to the # of lates. Do you have one stand alone late or do you have rolling lates or three 30 day lates in a row. Severity refers to how late it is and what type of late it is. 90 day lates are worse than 30 day lates. Mortgage lates are worse than credit card lates. Judgments, charge offs and tax liens are more severe than revolving lates and will affect your score more severely. 2. Credit Utilization- Measures balances to available credit or credit utilization. It is looked at from two standpoints, utilization per trade line and global utilization or total balances to total credit. It tends to focus on revolving (credit card) trade lines vs. installment debt (car loan) as it is expected you will have a balance on an installment loan. I recommend keeping balances to available on all revolving debt as low as possible. I also recommend more revolving cards because this will increase your available credit so balances to available ratio will go down. 3. Credit History- Simply, the length of open accounts. The older the date opened on the card the better. Old credit is good because it shows a long history, new accounts actually hurt your score because they are not seasoned and imply that you are in need of new credit, signifying you may be in financial strain. 4. Type of Credit- Looks at credit mix. A good credit mix is better for your score, so having an installment loan (car loan, mortgage) and revolving debt (credit cards, line of credit) is recommended. Having not enough credit can hurt your score so it is recommended to have a minimum of at least 4 trade lines. Avoid debt consolidators (finance companies) that offer to consolidate and lower scores your interest rate or same as cash offers as finance companies hurt your score because they are classified as debt consolidators. 5. Inquiries- Credit scores look at the number of inquiries (people pulling your credit) over the last 12 months. The less inquiries the better. There are many myths about how much an inquiry drops your score and to avoid them at all cost. If you have to pull your credit, just be conscientious of who is doing it and how many times. It is my understanding that each inquiry hits your score about 5 points. If you get a mortgage and a bank pulls your score, you get hit for the 1st pull, but subsequent mortgage pulls in a 30 day period does not hurt your score. Also, new credit leads to an inquiry. 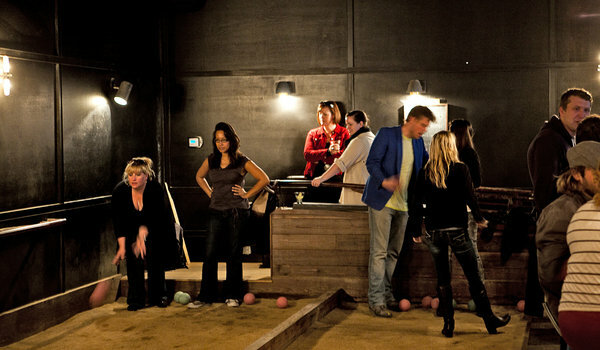 The indoor boccie ball court at Make Westing, a bar in the Uptown neighborhood of Oakland, Calif.
On a recent warm afternoon in the Uptown neighborhood of Oakland the streets were alive with activity. Crowds participating in Art Murmur, a monthly art walk, spilled out of galleries like Johansson Projects (2300 Telegraph Avenue; johanssonprojects.com) and Hatch Gallery (492 23rd Street; hatchgallery.org). It’s hard to imagine that this area, just north of downtown Oakland, was abandoned and plagued with crime just a few years ago. Now it bustles with hip bars, places to hear music and interesting restaurants that have even lured San Franciscans across the bay. The scene that afternoon at Bar Dogwood (1644 Telegraph Avenue; bardogwood.com), which opened in March, was casual and friendly as the after-work crowd sipped signature cocktails and sampled locally sourced meats from its charcuterie. Vintage Edison phonographs made into speakers hang from the ceiling, and photographs show Oakland in its heyday in the 1930s and ’40s. Lexi Filipello, the owner of Dogwood, said she had tried to open a bar in Oakland in 2002, but the city wasn’t receptive to new businesses then. “It was like a ghost town here,” she said. “Then Cafe Van Kleef opened.” Often referred to as the godfather of Uptown, Peter Van Kleef took a chance on the neighborhood, and the success of his bar (1621 Telegraph Avenue; cafevankleef.com) encouraged other business owners to move in. One of the newest kids on the block is Make Westing (1741 Telegraph Avenue; makewesting.com), where happy hour was in full swing that fall afternoon. The bar’s modern, industrial interior is striking, but most noticeable that day was the cast of characters — an interesting mix of ages, ethnicities and styles — lining the bar and playing at the indoor boccie court. A few doors down at the Fox Theater (1807 Telegraph Avenue; thefoxoakland.com), one of Oakland’s architectural gems, there was a line around the building waiting to see the Smashing Pumpkins perform. Next door is Rudy’s Can’t Fail Cafe (1805 Telegraph Avenue; iamrudy.com), a hot spot for post-show comfort food. With Mike Dirnt of Green Day an owner, Rudy’s puts a punk spin on the classic American diner, complete with kitschy music-themed décor, a tattooed servers and booze-filled milkshakes. For a more intimate vibe, veer slightly off Telegraph Avenue to Bar 355 (355 19th Street; 510-451-3355), where the speakeasy-style décor, moody lighting and skillfully prepared drinks make it a cut above the average dive. You could almost miss the Starline Social Club (645 West Grand Avenue; thestarlineballroom.com). Housed in an unassuming building from 1893 still bearing the logo for Starline Janitorial Supplies, the social club is a tribute to a bygone era complete with original Victorian details. Original New York Times article here.